Week 11 concludes itself with a potential Super Bowl LIII preview in Los Angeles between the Rams and the Chiefs on Monday night. Hopefully, the matchup can hold up to Sunday’s exciting slate of games, which treated us to nine of eleven meetings ending in a one score differential as teams jockeyed for a playoff berth, seeding, or just played for pride. Let’s focus on some of the standout defenders from the day and highlight at least one key signature statistic for each. Key Signature Stat: Tallied a pass-rushing productivity of 19.8. 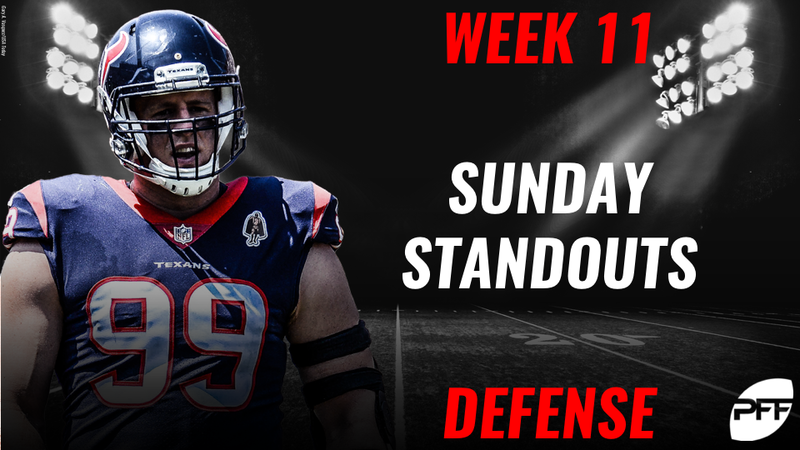 Lately, it’s felt like death, taxes and a dominant Sunday J.J. Watt performance were the only certainties in life. Watt did his part on Sunday with 11 total pressures (10 hurries + 1 sack) on 40 pass-rush snaps, resulting in a PRP of 19.8. He also registered 14.3% run stop percentage, notching three stops on 21 run defense snaps. Key Signature Stat: Produced five defensive stops. It wouldn’t be a Sunday without a Chicago Bear gracing this list. Entering the week with PFF’s fourth-highest grade amongst interior defensive linemen, Hicks was a menace all night. He again showed well both against the run and pass. Of his five tackles, all were considered stops – solo defensive tackles made which constitute an offensive failure. He also added a sack and two pressures. Key Signature Stat: Produced four defensive stops. Hargrave played a huge part in the Steelers’ victory in Jacksonville, both rushing the passer and stopping the run. He sacked Blake Bortles twice while adding another hurry that led to a Bortles incompletion. The 2016 third-round pick also batted a pass at the line of scrimmage, only adding to his stellar production on the day. On an extremely lackluster Oakland defense, signs of promise and early production do reside in their rookie second (Hall) and fifth (Maurice Hurst) round picks along the defensive line. Hall, the early pick from FCS Sam Houston State University, was one of the only Raiders defenders able to generate multiple pressures (three) on the day. He also added two run stops on 17 run snaps to round out a promising performance. Key Signature Stat: Had a 13.6% run stop percentage. Davis follows his highest graded game of the season (91.0 – Week 9 against Houston) with another excellent performance. He made plays rushing the passer (one QB hit and one QB hurry), against the run (three run stops), and in coverage (1 pass breakup), while allowing one of three passes to be caught in his coverage for just eight yards. In his third year as a full-time starter, Davis continues to play a higher percentage of snaps as he earns the coaching staff’s trust to remain on the field on passing downs. Key Signature Stat: Allowed just 0.08 yards per coverage snap. The 13-year veteran continues to be a key piece for a high performing defense. On Sunday, his excellent play led to only three targets on 49 snaps in coverage, ultimately allowing one catch for a mere four yards. That’s what we call a quiet day at the office. The 2017 Defensive Rookie of the Year led his secondary’s most impressive performance of the season. He allowed two of four passes thrown in his coverage to be caught for only eight yards on the day, while also picking off a deep Carson Wentz pass late in the first quarter. He continues to gradually move up the positional rankings as the season progresses. Key Signature Stat: No yards allowed in coverage. Harris did not allow a catch on the two targets in his coverage and continually made impact plays, coming down with two interceptions and adding a pass breakup in the losing effort in Chicago.